An early single, “Like, Long Hair,” charted, but whatever momentum that instrumental cut might have afforded the band stalled when Revere was drafted for military service. Revere claimed conscientious objector status and was instead assigned to a job as a cook in a mental institution. The group released a version of that song — Richard Berry’s “Louie, Louie” – recorded within days of, and at the same studio as, the version by another regional group, the Kingsmen. The latter group, with access to better distribution than the self-released Raiders version, got the hit. 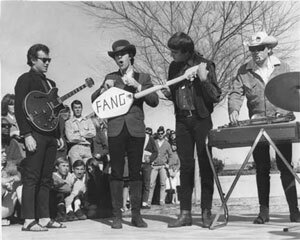 By 1963 the Raiders’ lineup included Mike “Smitty” Smith on drums, and Drake Levin on guitar. During this period the group’s raw and largely R&B-flavored set list consisted mostly of covers. The Raiders’ reputation grew on the strength of their raucous, high-energy live performances. 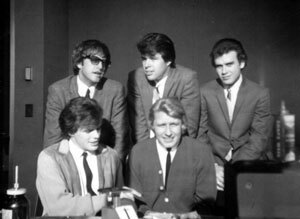 Mark Lindsay says that onstage, the Raiders had been “wearing collarless blazers, like any number of groups, quite frankly. Paul Revere and I were walking in downtown Portland one day, to pick up our dry cleaning. We happened to pass a costume shop, and in the window was a mannequin dressed in a three-cornered hat, Revolutionary coat and tights. 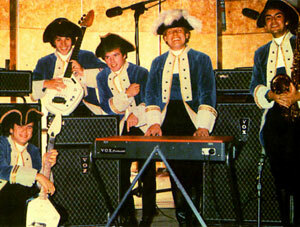 I turned to Paul and said, ‘You know, that’s the way Paul Revere and the Raiders should dress!’” They rented the costumes and wore them for the second act of that evening’s show at the Lake Oswego Armory. It was a one-night rental, “just for a gag,” Lindsay says. But once onstage, “the whole tenor of the band changed. 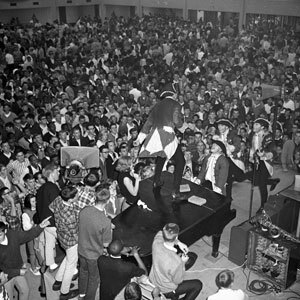 We were always crazy, but we became…insane.” The next time they played in Lake Oswego, sans costume, “the kids crowded around us and asked, ‘where are the outfits?’” From that point until the late sixties, the band always performed in costume. 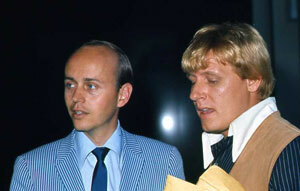 In Part Two we’ll take a look at the group’s move to Los Angeles for their big break on television and record.